"In Like Flint, that's my favorite movie!" The Bond pictures were unbelievable financial successes in the 1960s, each of them grossing the equivalent of today's Spider-Man or Star Wars: Episode II. The easiest way for the other studios to get a piece of the pie was not to launch their own spy franchise�though Universal tried with its Harry Palmer series�but to produce parodies of the already familiar Bond formula. Fox produced the first successful Flint film, Our Man Flint, in 1966. A scant year later, In Like Flint was released, promising more of the same�a zany scheme, lots of lovely ladies, and the antics of ultra-cool agent Flint. But already the movie feels formulaic, a retread of the rough but entertaining first film. I suppose it's poetic justice that a series spoofing the stagnant Bond franchise would itself succumb to the lure of formulaic plotting. Still, if you're in the right mood, Derek Flint provides generally pleasing escapist fare. This time around he faces off against a cadre of evil, wealthy, and powerful women business tycoons who plan to take over the world using mind control. Their method of delivery? Beauty salon hair dryers. Quite the inventive scientists, they also manage to replace the president with a clone. 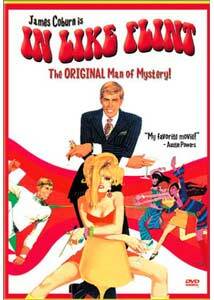 Derek Flint (James Coburn) is brought on the case when his boss can't account for a few minutes he spent with the president (during which both were knocked unconscious so the doppelganger could take the president's place), and it's up to him to figure out what's going on and infiltrate the ladies' lair�a secret spa known as Fabulous Face. Can he prevail, or will he too be seduced by the brainy beauties? So, yeah, it's another Flint film about a group of women taking over the world, the feminist message counteracted by all the skimpy outfits and sexual innuendo. James Coburn is as American as James Bond is English, and he exudes a certain vintage cool that's quite entertaining to watch. But the humor of the previous picture, which admittedly in itself felt like a bunch of disparate ideas thrown into a blender, doesn't quite gel�the set-up is interesting (especially when it is revealed that the women are actually in cahoots with some army officials), but the potential for humor feels wasted. The pacing is off as well�Flint isn't even officially on the case until a half-hour into the picture (which feels, incidentally, a half-hour too long at just under two hours). Even so, In Like Flint is still a decent comedy, with a few worthwhile laughs. Jerry Goldsmith contributes a lively soundtrack, and the production designers, some whacked out, colorful sets. The law of diminishing returns for sequels exists even today, particularly within the spy spoof genre�witness the Naked Gun and Austin Powers films�but Derek Flint still retains his mojo through most of In Like Flint. Incidentally, the title is a bit of a dirty joke, a reference to the old saying "in like Flynn," as in Errol, lady-killer and man-about-town. Image Transfer Review: This transfer looks surprisingly good considering the vintage of the film; I was certainly expecting a lot worse. The color palette is nice and rich, with bright colors accentuating the "mod" mise en scene. The print shows some graininess and a few scratches here and there, but nothing too serious. The only real problems are an overall softness and some occasional aliasing. Audio Transfer Review: As mono tracks go, this one isn't bad. Dialogue is always clear, and sound effects and music sound fairly good, though the score does seem to be lacking support in the high end. A remix would've been nice, but the original tracks suit the material well enough. Extras Review: Originally to be released as a double feature DVD with its forebear, this single disc edition of In Like Flint includes by way of extras only the trailer and a gallery of clips for Our Man Flint, Fathom, and Modesty Blaise. In Like Flint isn't quite as funny as its predecessor, but as Bond parodies go, it's suitably diverting. Fox's DVD doesn't offer much aside from decent audio and video, which probably explains the budget pricing. Pick this one up for a double feature with the recently released Casino Royale and you can spend an evening with movies that mocked Bond before he started mocking himself.